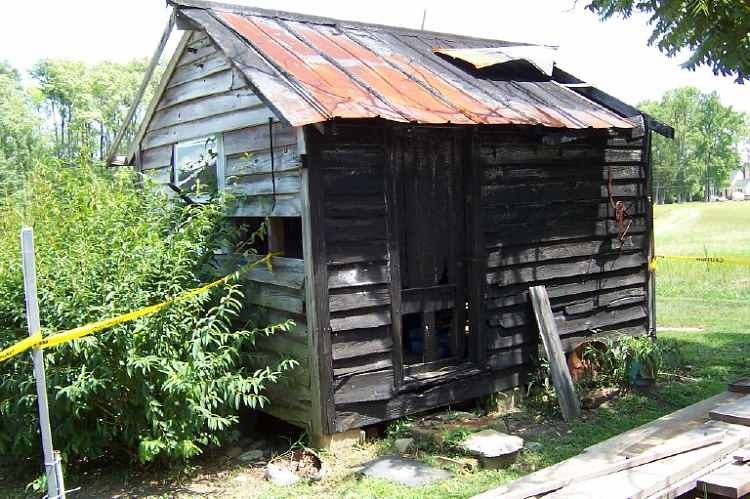 In late August of 2009, museum volunteers started work on restoring the circa 1938 Wash House located on the museum campus. The building has served multiple uses throughout its history and was saved from a disastrous fate when it was threatened by a barn fire at the museum in 2007. Fireman continued to douse the building with water to prevent the Wash House from being consumed by flames. With the help of a family member, the museum has been able to obtain some history of the building. Although who originally constructed the building remains unknown, such efforts would have typically been completed as a "barn raising" type of project with neighbors, friends and family members all helping. We know that at some point in time the building was used as a wash house and contained a hand cranked washing machine. An oil stove was used to heat the water for washing and two wash tubs were used along with the washing machine for hot rinses. Following washing the clean clothes were hung on a line strung from the back corner of the building to a pole. In or around 1945, washing chores were moved to the enclosed back porch of the farm house. This same back porch now serves as the main entrance to the museum. When museum volunteers were raising the Wash House to facilitate restoration, the team discovered that one of the corner concrete piers supporting the structure had the date of 1938 etched into the top of the pier. Armed with this information and help from a family member, we think the building was built in the late 1930's. There was much work to be done to restore the building to a stable and meaningful structure for visitor viewing. The interior of the building appears to have weathered the approximately 70+ years of use. However, the exterior and roof was in dire need of intensive repairs and replacement. All or most of the clabbered boards required replacing, as well as the metal roof. © 2010 Poquoson Museum. All rights reserved..